How's the week going for you so far? I was talking with my hubby (Mr Gary Jones) at the weekend and we were commenting on how quickly March has come around. The years seem to go by faster and faster don't you think? Anyway, we were talking about how March is such a mixed bag weather wise in the U.K. One minute it's sunny the next it's raining ..... March many weathers! That feeling of dread when I pulled up in my car outside the school gates when it was time to pick up my son. The absolute horror that washed over me when I realised that I had left my hat at home not in my handbag where it usually lived! How was I going to make it up to the school gates with my hair still on my head in this weather!? It's the worst feeling in the world Isn't it? Well, OK - I'm sure there are feelings that are worse than this but at that moment you kind of go in to panic mode. Fight or flight. Today's blog post is to share with you our bestselling Grip band and to share how I genuinely wished that these amazing little bands were available back when I was younger. I certainly wouldn't have felt so panicked back then if I was wearing a hair grip band under my wig. What is the Hair Grip Band? The Hair Grip is an amazing little band that secures your wig in place without the need of clips, combs, tape or glue. Hold the band out in front of you with the label facing up in your right hand, and the logo facing down in your left hand. Life the band onto your head as if you were putting on a headband. The instructions should be facing down on the right side of your neck, while the logo should be facing up on the left side of your neck. Secure the band by pressing the Velcro together ON THE BACK OF YOUR NECK. Adjust around the head for more comfort and re-secure the Velcro if needed. Simply place your scarf, wig or hat directly on top of the band. When wearing a wig, you can close it's clips and have the combs rest on the band. Adjust around the head as necessary and enjoy the comfort. 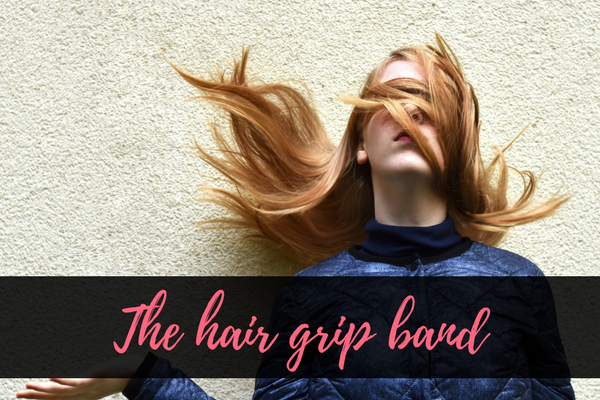 I put the Hair Grip band to the test a few months ago and I was so impressed that we started keeping a regular stock of them in the Aspire shop. They really have been so popular and I can't see us not wanting to keep a good supply of these in stock any time soon. Have you worn the Hair Grip band?